Saint Tryphon, Archimandrite of Vyatka, was born to pious parents who lived in the Archangelsk diocese, and baptized with the name Trophim. His parents intended to marry Trophim off, but from his youth he desired the monastic life, after his parish priest taught: "Keep the purity of body and spirit. For whoever will preserve purity and take upon himself the angelic, monastic schema, the Lord God will adjoin him to His elect." Hearing this he secretly left his home for the city of Ustiug, where he took up residence with a parish priest who dwelt in strict fasting and prayer. He then lived in the town of Orlov along the Kama River on the church porch, enduring hunger and cold. Once in winter, the blessed one walked along the high, steep bank of the Kama River, passing the Stroganovs. Seeing the poor wanderer, they grabbed him and threw him down from the height to the river, and below there were deep snow drifts. When the blessed one fell into the snow, a snowdrift broke from the top of a mountain, so that he was not visible for a long time. But the jokers repented and felt sorry for the blessed one. They went down, carried the Saint from there, and took off their boots to shake off the accumulated snow. At the same time, they themselves suffered greatly from the bitter cold and marveled at the fact that the monk was cheerful in his face, and seemed to spread warmth around him. They asked for forgiveness from the monk and immediately received it. Arriving home, the Stroganovs told their master Yakov Stroganov about the incident on the bank of the Kama. 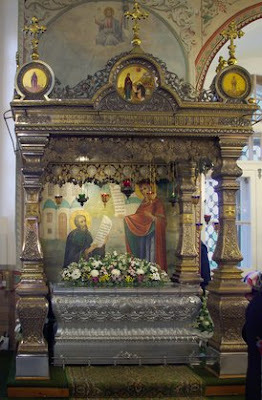 The next day, Yakov himself came to the parish church to meet Trophim. He addressed him after the end of divine service: "Truly you are God's chosen one, in everything similar to the ancient saints. I ask you for the Lord's sake, help me. At first I had many children, but by God's will they all died. Only one son Maxim is left, but he is also sick. I beg you, pray to the Lord for him. By your holy prayers, the Lord will grant him health. I will help you with anything." Trophim replied: "What you ask for is not ours, but God's, to give. I am sinful and unworthy to take on such a great cause. But great is the grace of God." After this, Tryphon prayed for the healing of the son of Yakov, and the boy soon recovered. Leaving Orlov he came to Nikolsky, where he met Juliana, the wife of an orderly man, Maxim Fedorov. Their two-year-old son Timothy was very sick, and the woman asked Trophim to pray for him. After a night of prayer, Timothy was healed. Fleeing the fame that came from these miracles, he moved on to the Pyshkorsk Monastery at the River Kama. Here Trophim was received into the monastic life and was tonsured under Abbot Barlaam with the name Tryphon. The 22-year-old monk did not miss a single church service, and he performed his obedience in the bakery. On summer nights, he would come out of his cell and, exposed to the waist, would give his body to be eaten by mosquitoes and gadflies, and as still as a pillar, he stood at prayer until the morning. He ate only bread and water, and then in moderation. He did not have a bed, and did not go to bed for a long time on the ground. When he fell grievously ill, probably due to his strict labors, his guardian angel appeared to him on the fortieth day of his illness to take his soul. However, as they ascended to heaven, a voice commanded the angel to take him back. Saint Nicholas then appeared to him and healed him, encouraging him even more in his ascetic effort. He also became known for his miracles, and many who were sick and possessed visited him and left healed. In search of solitude, the monk went to the Mulyanka River and settled at the place where the city Perm is now. Here he converted to Christianity the pagan Ostyaks and Voguli. This was done after he cut down their sacred tree, which was a cause of curses to the pagans and they offered sacrifice to the tree out of fear. When they saw nothing happened to the Saint after he cut down the tree, the proclaimed: "Great is the God of the Christians!" He was asked to return to his monastery, which he did, but he soon left in order to escape praise for being a wonderworker, after causing some dried-up springs to bring forth water. 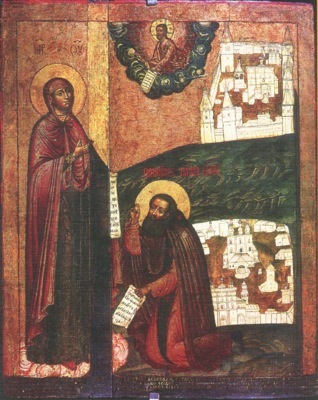 Then Saint Tryphon withdrew to the River Chusova and founded a monastery in honor of the Dormition of the Most Holy Theotokos. In 1580 he arrived in Vyatka, and he also founded a monastery there in honor of the Dormition and was made Archimandrite. Being a strict ascetic, he wore a hairshirt on his body and also heavy chains. The soul of the Elder longed to enlighten the lost with the light of faith in Christ. He devoted all his energy to this holy effort. At one time in Vyatka it did not rain from 15 August to 8 September, that is from the Dormition to the Nativity of the Mother of God. On the 8th of September the Mother of God appeared to Tryphon and told him to command his workers to get back to work in bulding the monastery, which they neglected, and after this it rained again. 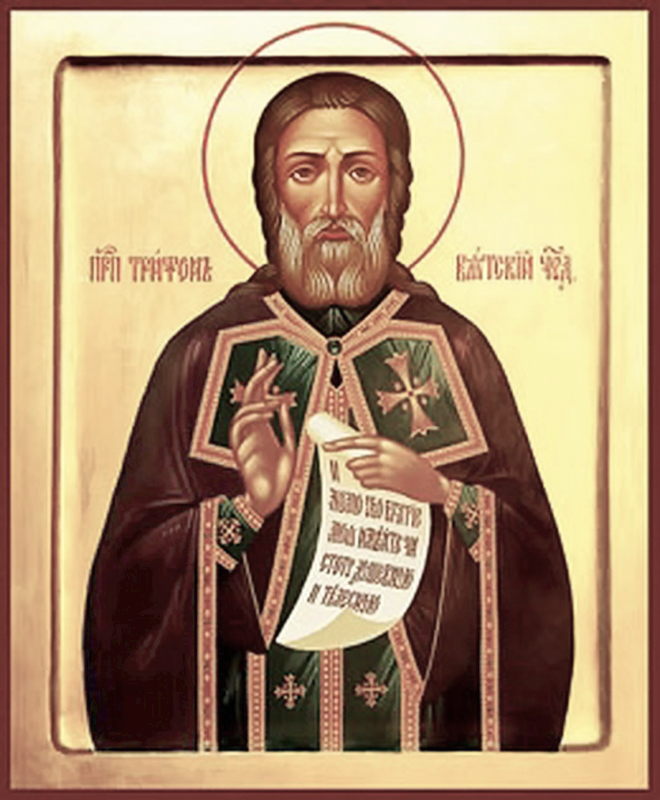 Before his death, Saint Tryphon wrote a last testament to the brethren, in which he says, “Fathers and brethren, the flock gathered about Christ, heed me, a sinner. Though I am coarse and worse than any, God and His All-Pure Mother have permitted me, a sinner, to manage His household. I beseech you, for the sake of the Lord and His Mother, to have spiritual love among yourselves. Without this no virtue is complete before God. The lips of Christ spoke to the disciples, 'Love one another' (Jn. 13:34). And in the words of the Apostle Paul, 'Bear one another’s burdens' (Gal. 6:2). Do not condemn one another before God, whether in the temple or in the cell, either alone or in common with the brethren. Pray with the fear of God. And by no means neglect church singing; although there are other matters, hasten to church to God for spiritual song. First give to God what is God’s, and then fulfill the other matters.” Saint Tryphon fell asleep in the Lord in old age on 8 October 1612. He was buried in the Vyatka Monastery he founded, and succeeded by his disciple Jonah, who promised to keep the monastic rule unchanged. In 1648 his honorable relics were found to be incorrupt.